To give interested students further opportunity to develop and test their programming skills to solve a variety of problems. To promote student interaction with faculty above and beyond that found in the classroom. To foster a communicative atmosphere enabling collaborative efforts between faculty and students. To prepare students for participation in annual programming contests such as the ACM International Collegiate Programming Contest (ACM ICPC), International Olympiad in Informatics (IOI), and Topcoder Challenge. The book on the left, Programming Challenges, is one of the resources that we are consulting for problem ideas, but is not our exclusive source. 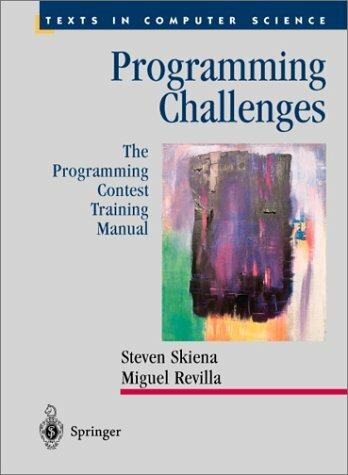 This book contains many examples, and also discusses one online judge that can be used on over 1000 problems, handling programs written in C, C++, Java, and Pascal. We plan to use Java when discussing practical implementation of solutions to problems we consider. Also, we're using the Online Judge that is available at the Universidad de Valladolid, as it has a larger problem set to choose from. Last modified 22 September 2008.